Will the 2016 Ford Explorer Price Give You What You Want? Does the 2016 Ford Explorer Price Buy What You’re Looking for? In perusing the available vehicles within the crossover and SUV market, consumers will want to know how the 2016 Ford Explorer’s price measures up against rival vehicles—and what that price actually buys in terms of amenities. 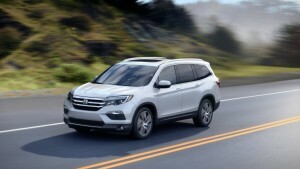 Does a competing vehicle like the 2016 Honda Pilot offer more for the money? Keep reading, and we’ll compare what these two nameplates cost and what each offers in the area of amenities. In terms of features, the Pilot and Explorer models offer various amenities in common, including a rearview camera, hill start assist, brake assist, tire pressure monitoring system, steering wheel–mounted controls, multi-function remote, a third-row split bench seat, MP3 player, vehicle theft-deterrent system, power side mirrors, and privacy glass. The Pilot also exceeds the Explorer in terms of cargo space, offering up to 109.2 cubic feet of cargo capacity compared to just 81.7 cubic feet in the Explorer. The Pilot further offers greater passenger room, with seating for up to eight passengers while the Explorer only seats seven, and offering up to 153.1 cubic feet of passenger volume compared to only 151.6 cubic feet in the Explorer. Drivers can further explore the outstanding 2016 Honda Pilot in person at any Central Illinois Honda Dealers location. Visit or contact one of our affiliated dealerships today to take a test drive onboard this outstanding SUV and see what it has to offer over the Ford Explorer price. 0 comment(s) so far on Does the 2016 Ford Explorer Price Buy What You’re Looking for?